M & S Ladies Peep Toe Shoes Size 6 Colour White New,ankle strap nice gold mirrored finish on inner heel.Dispatched with Royal Mail 2nd Class. Heel Pointed Women's Slingbacks, Black - Size 8. Dispatched with Royal Mail 2nd Class. Black Ruffle Strap Heels - Size 5. Never been worn Slight marks on bottoms are only from being in my cupboard Bought from Ego Dispatched with Royal Mail 2nd Class. 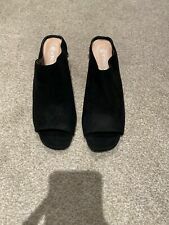 New Look black suede effect shoes size 5 wide for worn once in very good condition . Postage will be 2nd class signed for delivery. M&S Womens Wide Fit Bright Blue Sandals 8/42. Dispatched with Royal Mail 2nd Class signed for. Tried them on at home but never worn them so in great condition. Ladies high heels Size 7 ( job lot ). Mostly new unused without boxes some used but still in very good condition. Collection prefered due to weight but will post if nescessary. A superb pair of court shoes by M&S FOOTGLOVE. Flexible, light weight and hard wearing scoop wedge heels & soles. Genuine leather uppers in black. Well cushioned under foot insocks. 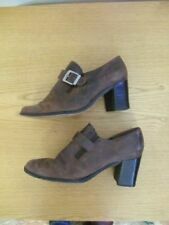 NEW LADIES size 8 wide fit, FOOTGLOVE SHOES, from MARKS AND SPENCER. Dispatched with Royal Mail Signed For® 2nd Class. Black - Size 6. never been worn..lace side detail Dispatched with Royal Mail 2nd Class. Marks & Spencer Statement Heel Wedges Women's, Black - Size 4 New. Condition is Used. Dispatched with Royal Mail 2nd Class. Marks & Spencer Statement Heel Pointed Women's Slingbacks, Black - Size 5. Dispatched with Royal Mail 2nd Class. Marks & Spencer Ladies Navy Open Toe Suede Effect Shoes. Size 5.5 UK. , Black - Size 5 heel ankle strap laddies shoes. Condition is Used. Dispatched with Royal Mail 2nd Class. Marks & Spencer Women’s Black Patent Court Wedge Shoes Size 6. Condition is Used. Dispatched with Royal Mail Signed For® 2nd Class. THEY ARE A SHOE BOOT TYPE SHOE THAT HAS A PEEP TOE AND FASTEN WITH A ZIP AT THE BACK. THESE GREAT SHOES ARE IN A BACK COLOUR AND I THINK THEY ARE A REAL SUEDE. IF YOUR ITEM DOESN'T REACH YOU, WE WILL DO OUR UPMOST TO SORT THIS OUT. Marks & Spencer Statement Heel Pointed Women's Slingbacks, Black - Size 6. Condition is Used. Dispatched with Royal Mail 2nd Class. Black Size 6 Heels. Condition is Used. Dispatched with Royal Mail 1st Class. M&S Navy smart heeled shoe,Size 6 1/2.Worn only once to a wedding, very comfy worn all day and no achy feet. Lovey shoe and feels sturdy to wear with a bit of height . Marks & Spencer Statement Heel Women's, Navy- Size 5, Used. Condition is Used. Dispatched with Royal Mail 2nd Class. Red, ankle strap with buckle fastening, heel 2" high. Original price £29.50. Black Ankle Strap Block Heel Shoe Size 5. Black Ankle Strap Block Heel Shoe Size 5. Never worn, labels still on the sole. Originally from Papaya. Dispatched with Royal Mail 2nd Class. M & S COLLECTION NAVY AND WHITE LEATHER COURT SHOES - INSOLIA. RRP £45.00. LOVELY SHOES. Women's Black Shoes - Size 5. Condition is New with box. Payment via PayPal. Marks & Spencer Black Court Heels. Ladies UK Size 6. Excellent condition and very comfortable. Metalika Woman’s Size 5. Condition is New with box. Dispatched with Royal Mail Signed For® 2nd Class. marks and spencer shoes. Size 5.5. Still with labels on. From pet and smoke free home. RRP £49.50. BLACK SUEDE COURT SHOES. AUTOGRAPH RANGE. UK SIZE: 8. Lady's shoes Size 6.5 M&S beige/ cream/ pinkish cappuccino, shiny 3.5 in heel wider fit/ regular. Very stylish and fashionable. Perfect for any age or occasion. V by very, Black heels - Size 8. Condition is New with box. Dispatched with Royal Mail 2nd Class. Women’s heels - Size 6. Condition is Used. Dispatched with Royal Mail 2nd Class.